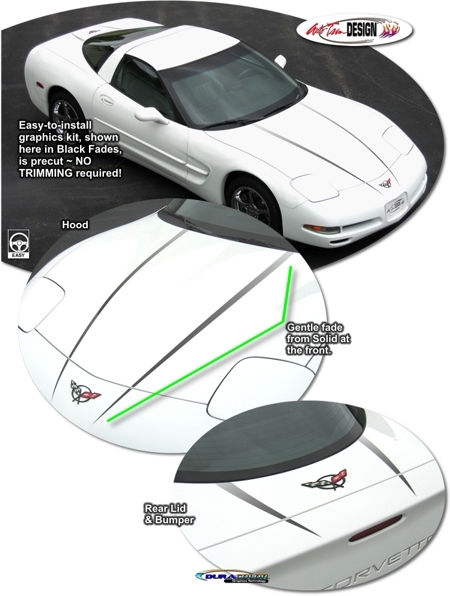 Enhance and highlight the attractive lines of your C5's Hood and Rear Deck Lid areas with this simple and unique graphic kit that starts as solid and fades to your vehicle's paint scheme as shown. Available in four (4) fade colors, this kit is very easy to install. Kit is specifically fit for the '97-'04 Chevrolet C5 Corvette (Coupe, Convertible & Z06) and will not fit any other vehicle.